The reviewer has been compensated in the form of a Best Buy gift card and/or received the product/service at a reduced price or for free. All opinions of the Sennheiser MOMENTUM True Wireless Earbud Headphones are 100% my own. It can be said that I, like most people, really enjoy music. So when the chance came up to try out the Sennheiser MOMENTUM True Wireless Earbud Headphones, I jumped at the chance. Sennheiser has a great reputation for producing quality headphones for discerning music fans. But can they carry that rich history of quality over to a wireless headphone? I’ll tell you, the answer is yes. Let’s take a look. The MOMENTUM range of high-quality headphones are the flagship for Sennheiser, and they have a history of an outstanding fusion of advanced technology and the highest quality materials. But now you can experience that ethos in a new product, the MOMENTUM true wireless earbud headphones. The premium Bluetooth earbuds are said to set new standards for audio quality, comfort, and craftsmanship. From my experience, they deliver on these promises. I have used the headphones for a couple weeks now as my go-to buds of choice, and I am pleased with what they deliver. 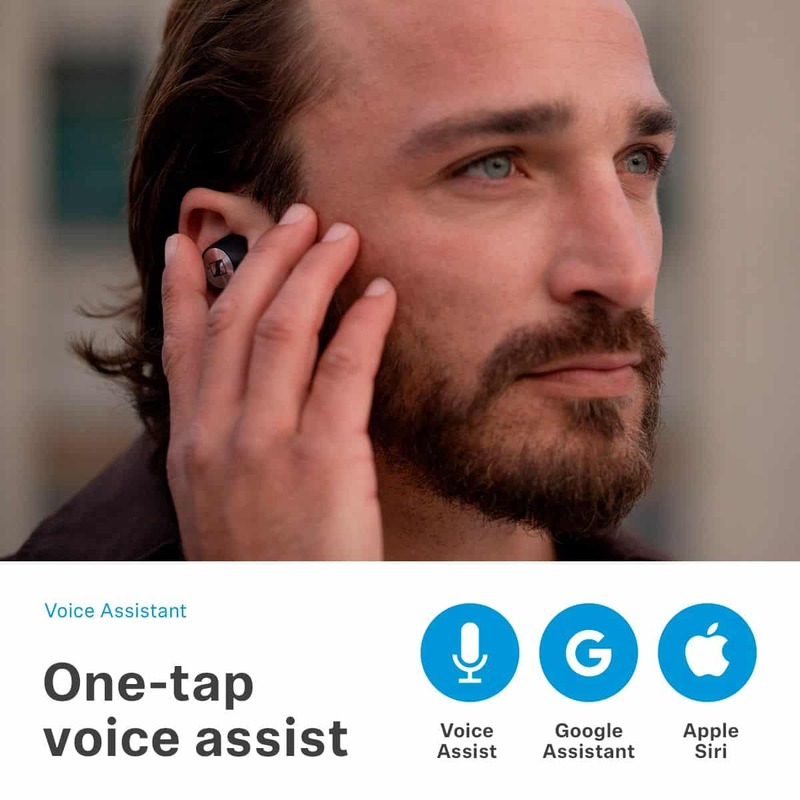 The headphones offer fingertip control of calls, music, and your favorite voice assistant through the use of a touch-sensitive surface on each earpiece. I like this much better than I did a somewhat hard to press button on other wireless headphones that I tested. With those, I often felt as if I was shoving the earbud into my ear canal just to adjust the volume or skip a song. With the MOMENTUM True Wireless headphones, it only takes a touch of a fingertip to activate the control. This is a much easier way to control the devices. Besides, if you are like me, even the best earbuds can have a precarious fit at times. Not having to push on the earbuds during operation makes it much easier to keep everything in place. Now, I do have to say that it does require a little getting used to the earbuds being touch sensitive. When you first start wearing a new earbud type of headphone, you will invariably be adjusting the units to make sure you have a good fit. In doing so, it’s easy to activate the touch-sensitive surface. Instead, get used to doing adjustments by gripping the buds by the side. This allows for better placement and allows you to get used to its operation without making any unexpected calls. But once you get used to it, I think you will really like the touch control. It would be wrong to talk about the controls of the MOMENTUM True Wireless headphones without mentioning the very cool Smart Pause functionality. To sum up how that works, just pop out an earbud to automatically pause the music. In practice, this works very well when you need to stop and talk to someone. Once you are finished with your conversation, just pop it back in your ear and your music picks up where it was before the interruption. One thing I really like about these earbuds is that they stay in sync with any content that’s playing on your device. 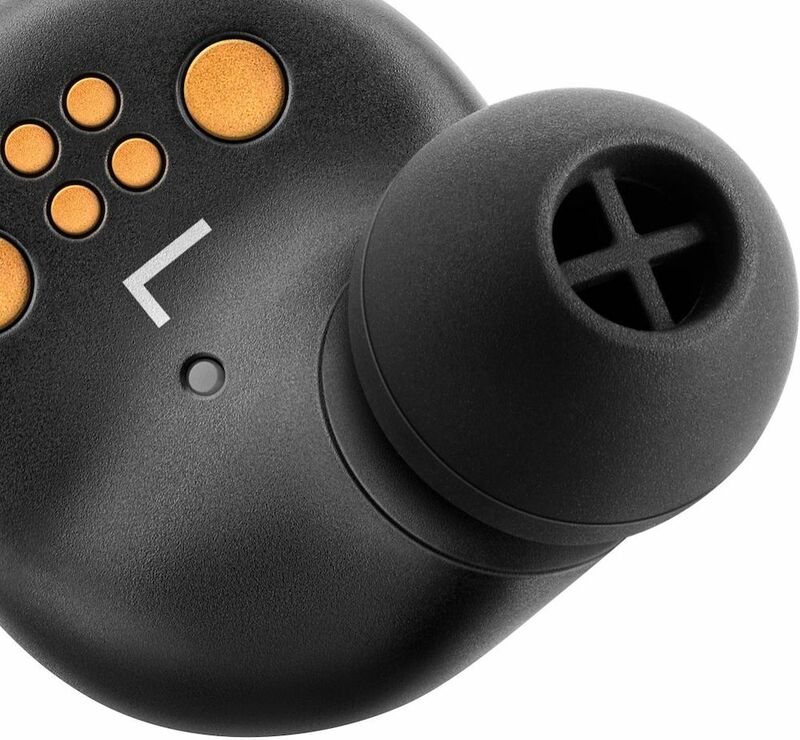 Other wireless earbuds that I have tried worked great with music but would have an irritating delay between the sound you hear and the screen. It would feel like you were watching a badly dubbed movie at times. The MOMENTUM True Wireless headphones had no problem with keeping things in sync. Sure, I use the headphones mostly for great quality music, but there are times when I will catch the latest episode of a favorite show on my iPhone. At those times, the headphones make it convenient to enjoy an episode without forcing those around me to share in the fun. And all without the sound lagging well behind the action on the screen. 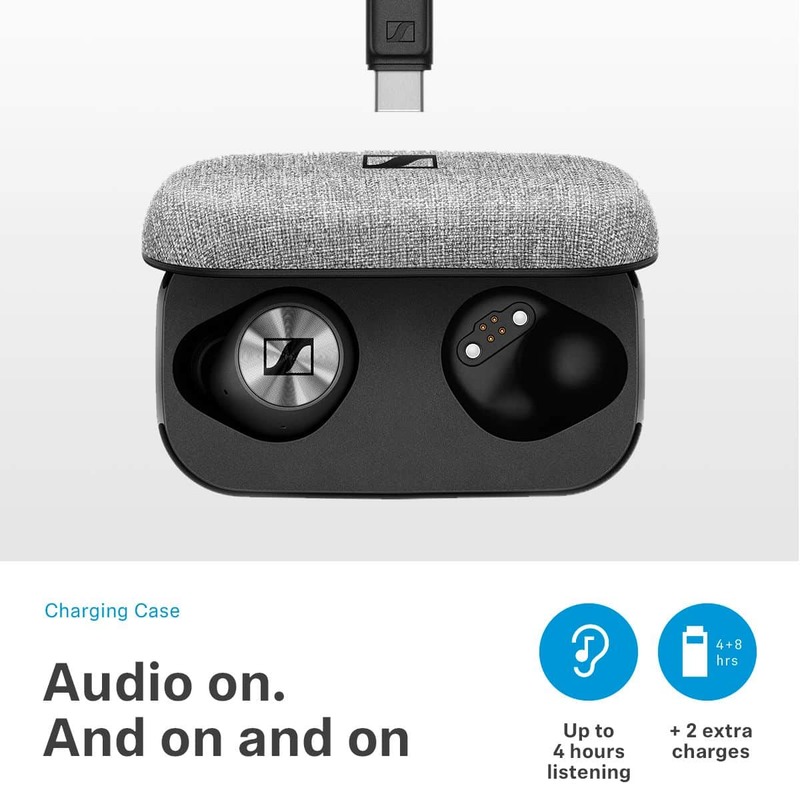 The headphones advertise 4 hours of battery life, with 2 additional charges held in the carrying case. From my experience, this seems to be about right. I can get 11 plus hours using the case to recharge twice before I am completely out of power. The case charges using a USB C connection, so it’s handy to grab a newer MacBook power supply and charge it back up before heading out. One thing you should be made aware of is that the Sennheiser engineers added a trickle charge to the system for keeping the earphones at their peak power charge and optimal battery life. But this also means that the phones, if left alone for a period of time, will continue to discharge until empty. I did not have a problem with this, probably because I kept the units in use often. But if you find them needing a charge after an extended period of non-use this is probably the reason. 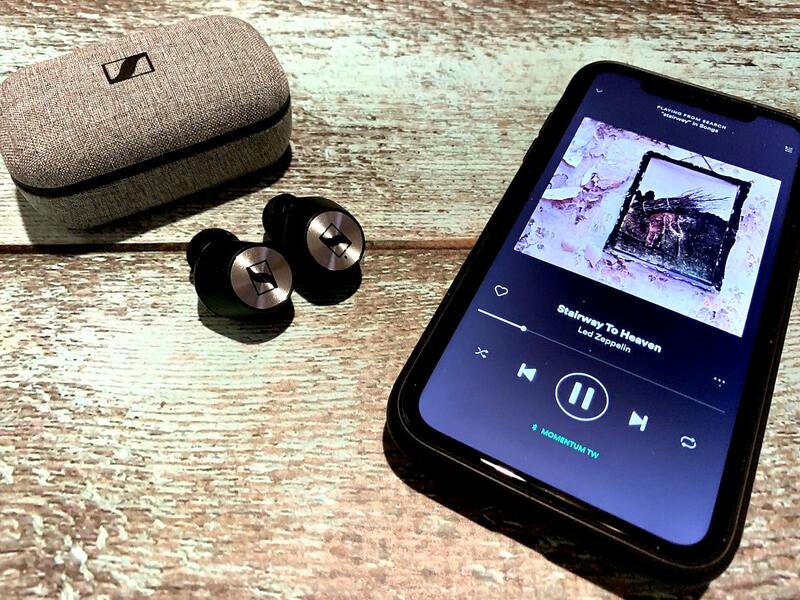 The MOMENTUM True Wireless headphones employ Bluetooth 5.0 to make sure that you have a hassle-free connection. This is also probably the reason that the phones stay in sync with media, as we discussed earlier. I found that the headphones did stay connected better than some other units I have tested. The units incorporate a two-mic beam technology, so it should help with a caller hearing you in adverse conditions. And if you find yourself in those adverse conditions, there is no need to worry,. The headphones are rated for IPX 4 splash resistance. One thing that I really like about these headphones is that they employ a function that Sennheiser calls “Transparent Hearing”. Earbuds of this type employ a form-fitting cushion to maximize the bass and sound quality. But this also seals out outside noise, for better or worse. But now, with only a quick double tap of the right earbud, you can hear everything around you. The headphones basically kick on the built-in microphones and amplify the sound of your surroundings. While it isn’t strong amplification, it does give the illusion, from a hearing standpoint, that you aren’t wearing the earbuds. You can choose whether or not you want to silence the music when using the feature, as well as adjust other controls, through the use of the available MOMENTUM app. This app is only a free download away. The earbuds ship with 4 different sizes of ear tips, allowing you to choose the correct size for your needs. I have a pretty big face with matching large ears, but I found that the large size tips fit with no issues. The four sizes do vary considerably, so you should have no problem finding what works best for you. I would encourage the user to try a couple different sizes to see what really does work best. Having a good fit is not only important for all-day comfort, but sound quality can be impacted if the wrong tips are used. If you hear strong bass and they feel comfortable, you probably have the right fit. But if you aren’t used to headphones of this type, you may have to give them a little time for you to acclimatize. I find the MOMENTUM True Wireless headphones from Best Buy are a welcome addition to my audio gear, and they are now my preferred earbuds. I really like the sound, the battery life is good, and I no longer have to fight with control buttons just to adjust the volume. 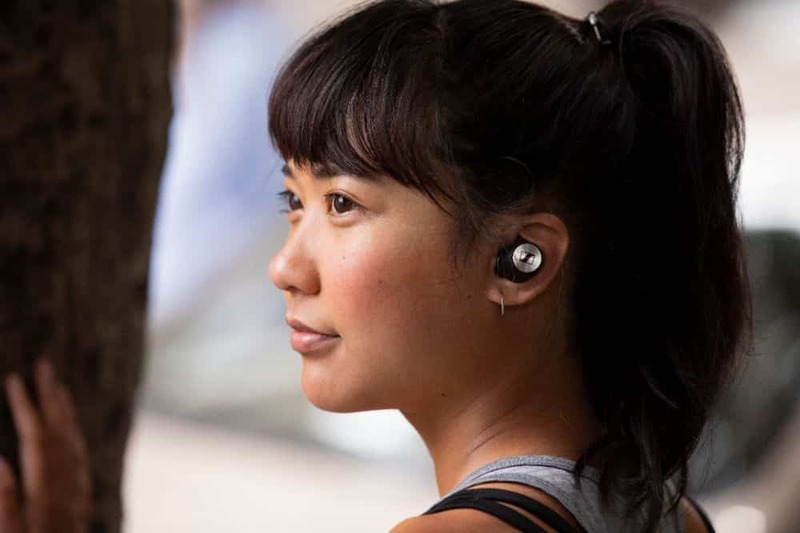 They are easy to use, and a couple of the smart features (Smart Pause, Transparent Hearing) should be standard equipment on all future wireless earbuds. Yes, they work that well.